While the true reality of Khilafat is bestowed by Almighty Allah on the Khalifa in order to properly function, the wider institution of Khilafat is comprised of many authoritative bodies and individuals all working to facilitate the support of the Khalifa in his objectives as a representative appointed on earth by Almighty Allah. One such institution is Shura or Majlis-e-Mushawarat, which enables the Khalifa to develop and grow the spiritual status of Muslims and society at large through an assessment of the fluid opinions and needs of the Umma and societies across the world. Shura (شُورَى)is an Arabic word that literally means consultation and, in its simplest form, as an Islamic principle, calls upon Muslims to gather and, through articulate debate and sound reason, form productive opinions and strategies of implementation to be presented to the Khalifa. This was despite the fact that the Holy Prophetsa did not require the advice of those around him. According to Muslims, he was the best of decision makers amongst Almighty Allah’s blessed creation and enjoyed a connection to his Creator whereby he was constantly under the guidance of Almighty Allah. Therefore, an individual who is charged with the responsibility of forming part of the process of Shura is a trustee and has an obligation to dispatch that trust with due diligence. At times, a trust can be a matter of life and death. For example, during the Battle of Badr, the Holy Prophetsa sought the consultation of his Companions regarding the strategic placement of the heavily outnumbered Muslim army. On taking the advice of Ibn al-Mundhir and other companions, the Holy Prophetsa decided to adjust his strategy and set up camp at a different location. There are countless other examples of Shura in practice during the lifetime of the Holy Prophetsa. The natural evolution and development of any growing state dictates that its dominion eventually expands over people of diverse societies and cultures. The institution of Shura is, therefore, not something to be taken lightly; it is a living and evolving entity that performs a key function in sustaining certain aspects of an Islamic State. A second important function of Shura that we learn from the above, is that it also enables the Khalifa to measure the capacity of those who are at his disposal. For the opinions made manifest during this process, coupled with the manner in which they are articulated, present the Khalifa with a direct reflection of the capacity of his devotees, the Muslim community as a whole and their aspirations – spiritual and temporal. 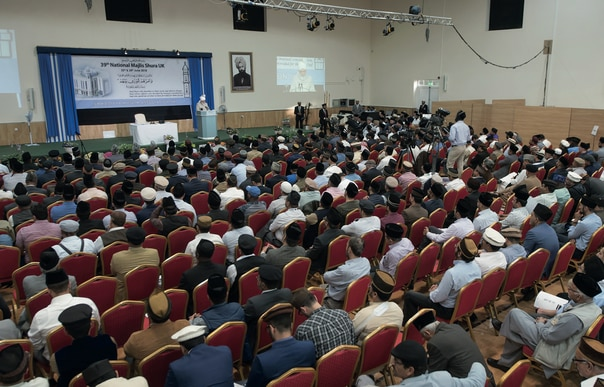 Shura forms a central artery within the Ahmadiyya Muslim Jamaat, and its genesis across the five successors to the Promised Messiahas has resulted in a well-developed model of Shura within the Jamaat. The Shura officially gathers once a year and falls directly under the Khalifa, with no intermediary between the two. The council consults on administrative matters relating to finance, education, missionary projects and other affairs of the community – forwarding its’ consensus and proposals to the Khalifa for consideration. Within the Jamaat, Majlis-e-Shura also acts to help to pre-emptively resolve any prospective issue that might arise between differing parties and thus strengthen the bonds of brotherhood. In addition to the formal system of Shura, there also exists a personal system whereby members can either arrange a sitting (mulaqat) with the Khalifa or write to him directly and discuss any issue they feel to be of importance. It is not uncommon for new initiatives to be put into motion as a result of direct communication. Shura is an integral part of not only Islamic Governance but also the social structures upon which society is built. In essence, the institution of Shura offers each and every individual, tribe, community, religion and nation, a voice by which it can actively affect change within their wider communities. It provides a safe and proactive medium by which new and innovative issues can be assessed so as to ascertain what is best for the collective and the individual. The real issue which faces Muslims is how to react to, and value, this blessed institution? While Shura is a central pillar of Islam, a mercy, its full benefit can only be realised, God willing, if those entrusted with partaking in it recognise and react to its true worth.